I can relate to your feelings. I am not a writer but I am participating in SOL. I struggle daily to write. I really just want to put something out there. I read another post today that was all about writer's craft and because I am not a writer, I don't think about including those things in my posts - but I teach my students to include them. It can all be overwhelming! This is a really great wonder, Melanie. I find that as a writer, I'm often more inspired to actually sit down and write when I read a piece that's still somewhat in process, still at work. As a reader, I'm very inspired by those polished perfect pieces, but they rarely get me thinking about my own writing or wanting to try something new in my writing. Great reminder here to share work-in-progress with our students! Wow, great perspective! I also, am in awe at many of the posts I read. They usually inspire something in me though, and that is exactly what I hope mentor pieces do for my students. Perhaps bringing our feelings as writers into the classroom via our "Slicing" experience would help grab those quiet ones. Thanks for your post. I think it's important that we show students other students' work (from previous years or other classes) so they can see what is a possibility for them too. Yes, professional work is the start for seeing the craft, but the power is in students using that craft. 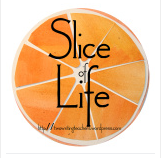 Slices are models for me to note what grabs me as a reader and can I try that too? I wish I had this March Challenge when I was still teaching high school. What a gift to share. So glad I'm here with you Melanie. I often think writers don't know the power of their own words. Whenever I read someone else's post I am overwhelmed by the craft, structure and voice. I think writing puts everyone on the line - it is vulnerable. If we honor this vulnerability by sharing, responding and growing I hope all of us continue to put ourselves on the line. I can honestly say I have never read a piece of writing, child or adult, that has not impacted me in some way. If we open with authentic response I think we will avoid all the other stuff! Thank you for being vulnerable and authentic -- the conversation needs to be opened and honored. Having peer sharing and showing early draft work, looking at changes in writing might help. I'm not sure how to change an attitude that is consistently so negative, and I've had some. My only response is to keep trying to focus on the good, and it is there. And sometimes our own judgement of who (or what) is good may not always be correct. Everyone has unique opinions, right? I appreciate your reflection: on the SOLSC, what it is like to read other writers' writing, and the classroom implications. One of the reasons I think all kids' writing needs to be shared as mentors is just for this reason. We all have something to teach others. I, too, have had moments of wonder when I read an awesome post and thought, "Yikes. I wish I could write like that." I appreciate your honesty here; and I think some of our students probably share these same sentiments. Like you, I have felt overwhelmed and at times, not worthy, during this Slice Challenge. There are so writers incredibly gifted with words. I'm not sure someone would have held my work up and said, "here's a mentor I'd like to use." That being said, I have been inspired day in and day out to try on new topics, pursue something that had been niggling at my writer's brain, or try a new writing technique by daily reading other's Slices. But your reflection about the classroom in incredibly valid - maybe we make sure if we use peer mentor texts, we make sure we don't always use the same people. Find remarkable in everyone's writing. I know I have found remarkable in everyone's Slices this month. I can so relate - many times I think how well someone writes and I despair that I ever will. Love how you relate this to our students. Such a thoughtful post. I relate to this so well. I am always questioning myself and wondering if I am a fraud. Really!? What am I doing thinking I am a writer? We all go there. Our slices reveal who we are on so many levels. I have to let myself be myself. If I am not myself, then I am really a fraud. We need to give that to our students as well. That is what blogging daily does for them, too. This is making me think about sharing a wider range of student examples with kids, from current and past students. If all they ever see are a certain type of on-target benchmark pieces then of course they are left wondering how their own writing matches up. But highlighting and teaching from a whole range of student work can help kids to see that writing can be all shapes and sizes. The SOLSC has certainly helped me see that a "slice" can take form in many, many ways. Knowing this makes me less afraid that my own writing won't fit the "mold." There is no mold! Or rather, the mold is very accommodating!